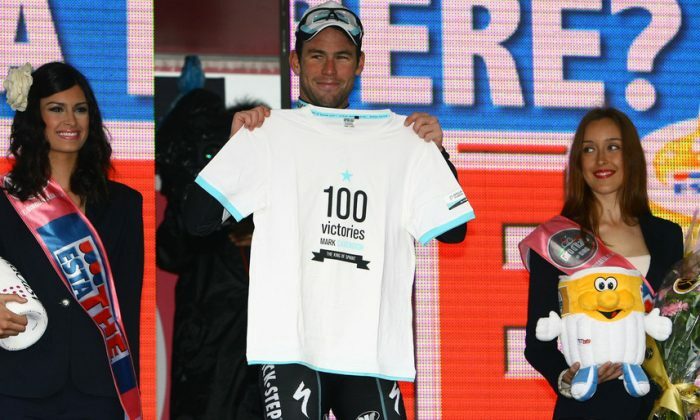 Mark Cavendish won his 100th sprint as a professional in Stage Twelve of the 2013 Giro d’Italia, despite pounding rain and a pair of categorized climbs. The Omega Pharma-Quickstep sprinter got the benefit of a decent leadout, with team mate Gert Steegmans delivering him 200 meters from the finish line, but Cavendish still had to work hard to win. Cavendish was very happy not so much because he won again, but because the Omega leadout worked really well under very tough conditions. “Before the stage there were teams saying, we’re going to help, we want a sprint but it was mostly us,” he told Eurosport.com. “We left it right to the end; it was a minute still with ten K to go. It was hard on us, in the rain, to pull it back. Cannondale came, but it was mostly on my men. “Young Julien Vermote, he pulled and pulled until his legs couldn’t go around anymore, I thought he was going to go, but he just kept coming back. “Matteo Trentin, he’s going to go with a kilometer to go, but with two-and-a-half K to go he has to take over and he just rode and rode and rode. “Gert Steegmans could have gone and left me in No Man’s Land but he kept waiting and waiting patiently; I was stressing to be honest, and then I was able to go. After climbing two short but very steep hills—one with ramps of up to 18 percent, the other 14—on a cold day in drenching rain, the Manx Missile had to fight off FDJ’s Nasser Bouhanni who was right behind and ready to pounce. Stage Twelve, Longarone to Treviso, was short at 134km, and with only two Cat Four the two climbs as close to a sprint stage at the 2013 Giro d’Italia offers. Everyone in the peloton knew that the sprint teams wouldn’t let a breakaway escape, but of course, some riders had to try—and they came surprisingly close to succeeding. Five riders: Fabio Felline (Androni Giocattoli,) Maxim Belkov (Katusha,) Bert De Backer (Argos-Shimano,) and Maurits Lammertink (Vacansoleil) attacked nine km into the stage, and worked together through the driving rain, over the short, steep hills, and to within 300 meters of the finish line. The break never got the gap much over three minutes, but they rode so hard, the peloton almost didn’t make the catch. The five breakaway riders had only 24 seconds seven km from the line, eleven seconds three km out, and still had 50 meters’ lead entering the final kilometer. Stage 13, Busseto to Cherasco will be another sprinters’ stage. It is the longest stage in the Giro at 254 km, with a Cat Three climb and another short hill in the final 30 km—not really a classic sprinters;’ stage, but the best they can get from the Giro this year. Look for Cavendish to make it 101 in Stage 13.